The Aon-CXP is low cost single link CoaXPress frame grabber. While it looks tiny, it has all the power of its big brother, the Cyton. It supports CXP camera speeds up to 6.25 Gb/S. The technology that Machine Vision components are built on are advancing rapidly in performance, while size and costs are plummeting. CoaXPress cameras, which traditionally were power hungry, large and expensive, are now small, cool and affordable. Single link cameras are coming out that are 29mm cubes. While this sounds tiny, they can still get 6.25 Gb/S worth of data over the link, almost twice the real world data rate of the USB3 Vision standard and significantly quicker than the latest GigE Vision data rates. The means you can get 2 MP images at 300 FPS! The Aon CXP has been designed for this low cost/high performance market. A small foot print single link CXP camera mated with the Aon-CXP can provide all the convenience of a GigE Vision or USB3 Vision camera system. It can compete on price; can exceed the cable lengths in many cases; and can provide a host of Machine Vision features missing from GigE Vision or USB3 Vision camera systems (triggers, encoders, strobe, waveform generators, quadrature encoder support, etc.). Further, because of the Aon’s advance DMA engine, no CPU resources are used in moving images to host memory. One of the biggest advantages of buying a frame grabber over a GigE Vision or USB3 Vision camera is that all of the hardware and software components of the capture system are sourced from one manufacturer. It is not a bunch of separate blocks from different manufacturers (including Intel and Microsoft). BitFlow wrote every line of software and firmware, and designed all their own hardware. So if you have a problem we can support you. If the problem is on our side, we can fix it ourselves and get you a solution in a short amount of time. The StreamSync system consists of an Acquisition Engine and a Buffer Manager. The StreamSync system was first released on the Cyton-CXP and is a departure from previous BitFlow frame grabbers. The StreamSync system is a complete redesign of the acquisition and DMA parts of a frame grabber. BitFlow used it years of experience in this area to design a next generation, super efficient capture system. 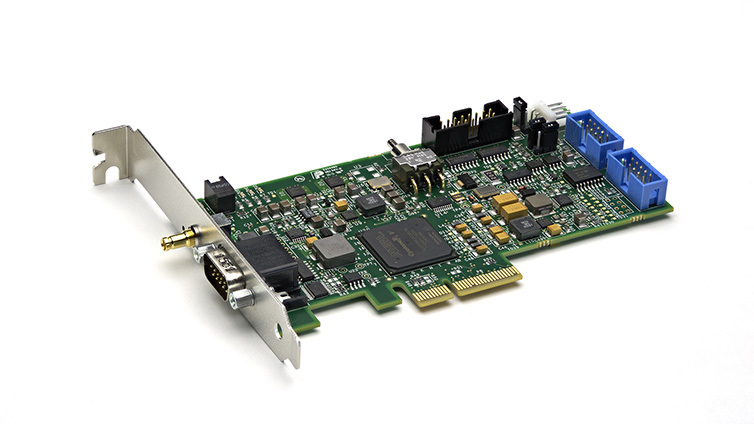 The Aon-CXP has a Gen 2.0 x2 PCI Express bus interface. The Gen 2.0 PCIe bus doubles the data rate of the Gen 1.0 bus while using the same footprint and connectors. The board will work in any Gen 2.0 slot, with a minimum electrical configuration of x2. This ensures the board will run at full capacity. The Aon-CXP can acquire fixed or variable size images and features a programmable ROI (Region Of Interest) sub-windowing capability. The Aon- CXP fully supports the CoaXPress 1.1 specification, which provides a high priority trigger packet from the frame grabber to the camera (note: both 1.1 and 1.0 cameras are supported). All I/O signals can be routed to/from many internal and external destinations, the flexibility of the routing is unprecedented in the industry. In addition, there are separate hardware I/O signals which can be connected to/from external source. Finally each CXP camera has a full set of these signals which can be run independently. The Aon-CXP board, as with our past interface products, supports not only simple triggering modes but also complicated, application-specific triggering and control interactions with your hardware environment. CoaXPress (CXP) is a simple, yet powerful, standard for moving high speed serial data from a camera to a frame grabber. Video is captured at speeds of up to 6.25 Gigabits/Second (Gb/S). Simultaneously, control commands and triggers can be sent to the camera 20 Mb/S (with a trigger accuracy of +/- 2 nanoseconds). Up to 13 W of power can also supplied to the camera. All this happens over a single piece of industry standard 75 Ohm coaxial cable. powerful and flexible. We’ve taken everything we’ve developed for the Cyton platform, and squeezed it into a small affordable package. Adding the Aon-CXP to your application is simple with our SDK, which supports both 32-bit and 64-bit operating systems. Applications can be developed using C/C++/.NET and our sophisticated buffer management APIs. In addition, free drivers can be download from our web site for most 3rd party machine vision packages. The Aon models are software compatible with each other, as well as with all the other current BitFlow frame grabbers. This makes migrating applications from Camera Link or analog to CXP simple and quick.